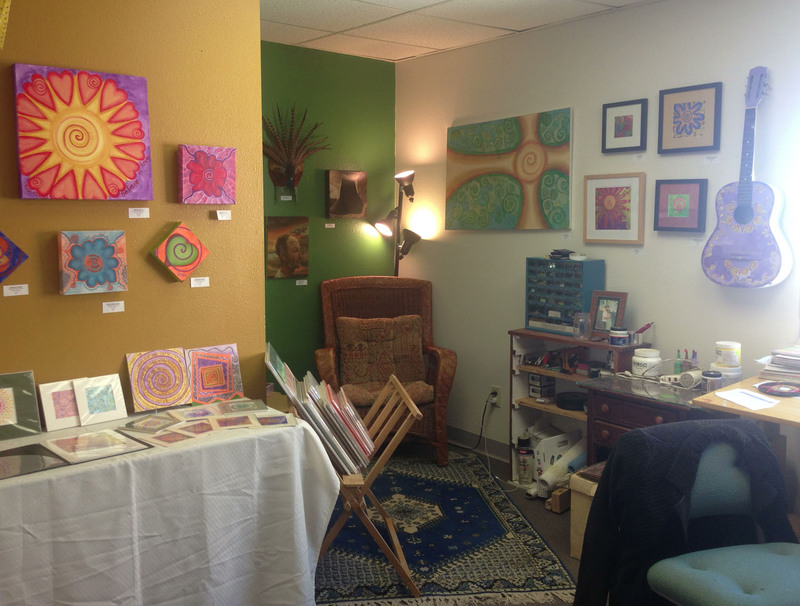 This past Saturday I opened my studio to the public. Unfortunately, this is the only photo I took! I used to be so good about getting photos during events like this. Not sure when I stopped. I was having so much fun socializing and greeting visitors that I totally forgot to grab my camera! I guess this means I will have to a paint a picture with words for you. My husband, Aaron Lewis, aka Guitar Aaron, played his classical guitar for us in the front lobby of Chroma Studios. Three other artists opened their studios too. Victoria Bryers in studio #3, Tricia Thorp in studio #5 and Jasmine Carpenter in studio #6. My studio is #7. We had a table set up with refreshments in the back hallway/kitchen area. The evening began with an ITEX member meeting. ITEX is a barter network that I am a member of. If you have ever thought about barter as a way of being, you absolutely, must check out ITEX. We had a toast with some yummy sparkling wine and I mingled with new people I hadn’t met before. I was happy to see several artist friends that I haven’t seen in literally YEARS. After all, it has been just over two years since I last opened my studio to the public. Towards the end of the evening a group of young artists came into the studio. They were dressed to impress and impress they did. One of them began by asking questions about how he should go about approaching local galleries about showing his art work. I offered my advice, basically, scout out all the galleries you can find and when you find one that you think your art would fit into, ask about their submission policy. I asked them all some questions and found out they had JUST moved to Albuquerque from Virginia. Like four days ago. I so enjoyed talking with these young people. I was reminded of myself at that age. They were almost surprised that I was offering so much information to them. Of course, I said, I remember being where they are now. I remember not having anyone to ask these questions. I have always promised myself that I would help out young artists as much as was possible with my knowledge, gained over the past 23 years of being an artist. I have been considering teaching a workshop on this topic and I think this encounter has pushed me over the edge of decision. I have decided that it’s important for me to share what I have learned. If I can help just one artist avoid the mistakes, trial and error I endured, it would be worth it. I guess I had better get myself in gear and write some workshop plans! I hope that you all are having a great start to the New Year! 2014 is going to be a GREAT year, I can just FEEL it! Today’s blog post is jumbled up in my head with a multitude of different ideas and themes. It started out as an update on our experiment to live without a car. During meditation this morning, the “Love, Pass it on” project came back to the front of mind. A reminder that I had let the ball drop on that important project. Then there is a looming deadline, my art show in November that I need to get ready for. On Monday, Aaron and I were asked to appear on a local public access show to talk about the Occupy Wall Street movement here in Albuquerque. That show is tonight and I still need to do some preparation for that as well. When it rains it pours, right? Today, I multitask as my mind swims with ideas. In between painting, building frames, writing and now blogging, my mind is awash in thoughts, goals, plans and what to do next. There never seems to be enough time to do it all. If only I could get by on 3 hours of sleep per night! Please bear with me as this blog post takes on the maze that is my mind and tries (possibly in vain) to tie it all together in one blog post. We have now gone four months without a car. That statement is a bit misleading, we have borrowed our parent’s cars a few times over the past four months. Usually for a day or two when we have errands to run that require a car. Picking up a bale of straw and a 50 lb. bag of feed for the chickens for example. Or more accurately, whenever we go over to the parental home and they insist on us taking their extra car because they aren’t using it. I am starting to think they don’t believe that we CHOSE to give up our van. REALLY, it WAS a choice! It’s almost as if they feel bad for us and can’t understand “how can you possibly live without a car”. I PREFER living without a car! Seriously! The only issue we have run into is visiting Aaron’s parents, who live in one of the only areas of Albuquerque that is totally void of a bus route. The closest bus stop is 2 miles away from their house. Though it is quite a lovely walk when the weather is nice. My life is almost stress free without a car! Riding the bus has given me more time for reading or just plain relaxing and reflecting. We have met some interesting people, but perhaps the best thing for me? I no longer feel any guilt about giving my money to the oil companies, polluting the earth or not getting enough exercise. Which reminds me, I have now lost 22 pounds! I credit this weight loss partially to having to walk to and from the bus stop or just walking to that next bus stop when the bus is going to be a while. I also credit it to switching to a mostly organic diet. No more processed foods, eating meat only once or twice a week, LOTS of local and organic fruits and veggies (thanks to Los Poblanos Organics, our local CSA). In short, I LOVE USING PUBLIC TRANSPORTATION! Living without a car leads me into my next topic. Occupy Wall Street. Yes, I have been out there. No, I haven’t camped out. OWS excites the HELL out of me! I am so happy to see this movement FINALLY happening! It has been a long time coming. I have been waiting for this since the election of 2000. I had a conversation with an older woman at the first local rally about the fact that she has been waiting since the Reagan years for something like this. This is a topic for it’s very own blog post. IT’S ABOUT FREAKING TIME WE (THE 99%) ARE TAKING OUR COUNTRY BACK!! I will spend more time writing a more thoughtful and intelligent post about this topic very soon. Now, for my “Love, Pass it on” project. I blogged about this project when I first started it. The idea is to take the “Free hugs” idea a step further. I created a few paintings for this series and plan to have stickers made with the images that will say “Love, Pass it on”. The vision that came to me in meditation this morning was of me, wearing a sandwich board that says “Love, Pass it on! FREE HUGS”. I will walk down Central Ave. (Albuquerque’s main street) handing out free stickers and giving free hugs. All the while telling people that I LOVE them, unconditionally! This is what the world NEEDS! People going out in public and telling strangers that you love them! I’m sure there will be people who think I am just a nut case, but they can have a free hug too! I am GOING to do my part in my small way and my hope is that it will catch on and others will do the same thing. I am hoping to find someone that would be willing to video my first time out so I can share it on you tube and facebook. So many people out there have NO love, no one to go home to, no one telling them “I love you”. Imagine what the world would be like if EVERYONE felt loved! Tonight is the First Friday show at the Factory on 5th. I am almost ready in the studio, busy printing business cards and rehanging art on the walls. My latest news regarding the Factory is starting in January I will no longer have my studio here. My two older sons have moved out of the house and it makes no sense to keep paying rent for an outside studio when we have two empty rooms at home. In some ways I’m happy about the move, I will be able to work anytime of the day, I won’t have to commute anymore which will save us money on gas, and we will save the money paid on rent. In other ways I’m not happy about the move, I will miss the artist friends I’ve made at the Factory, I will no longer have a “place of business”. At the same time, there will no longer be the distraction of the dramas that occur when more than 5 artists are working in the same building. One of the problems I’ve always had with the Factory is that the ceilings are open so there is no real sense of privacy. Everyone knows each other’s business. Music has to be low so it doesn’t bother the other artists. Some people don’t have my sense of courtesy, so there is always someone else’s music blasting over mine. I like to blast my music while I paint too, but I feel bad about annoying other people. I won’t have to worry about that anymore.